Apple has published an extensive report on supplier responsibility that addresses how the company works to ensure that all of its business partners are fair and socially progressive. According the report published on Apple's site, "the companies we do business with must provide safe working conditions, treat workers with dignity and respect, and use environmentally responsible manufacturing processes wherever Apple products are made." It outlines that suppliers are all required to commit to a comprehensive "Supplier Code of Conduct" as a condition of their contract with Apple. 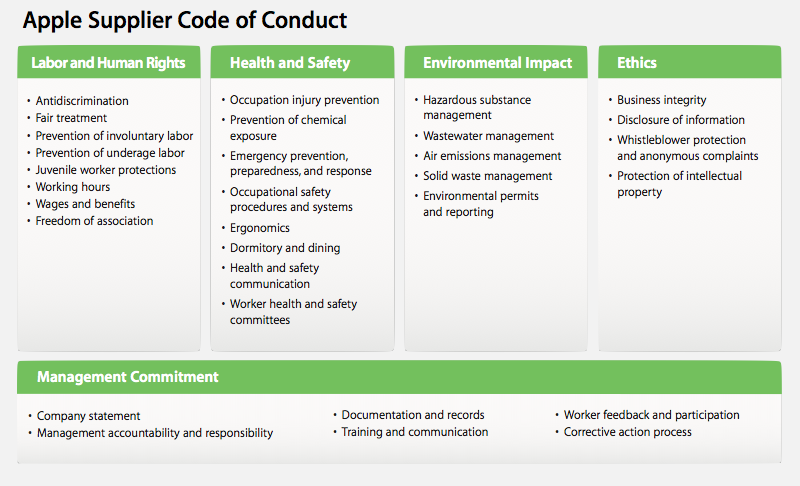 The Code "outlines a comprehensive set of expectations covering labor and human rights, health and safety, the environment, ethics, and management systems." The report states that the company drives compliance with the Code "through a rigorous monitoring program" that includes "factory audits, corrective action plans, and verification measures." Beyond monitoring compliance with the Code, the report says the company helps "suppliers meet Apples expectations by supporting their efforts to provide training in workers rights and occupational health and safety. "To further improve factory conditions, we proactively address industrywide issues through collaboration with our suppliers, government agencies, nongovernmental organizations (NGOs), and other companies." "Our biggest impact," the report states, "comes when we empower workers, proactively address underlying issues, and hold suppliers accountable for their practices." This program includes a variety of key activities detailed in the report. First, Apple says that its audits "indicate that suppliers need more specific information to validate that they are meeting our expectations." In that regard, the company says it has "developed seven clarifying standards that address details related to Dormitories, Juvenile Worker Protections, Medical Non-Discrimination, Pregnancy Non-Discrimination, Prevention of Involuntary Labor, Wages and Benefits, and Working Hours." Second, Apple reports that it has "implemented a social responsibility train-the-trainer program for all of Apples final assembly manufacturers," an initiative that has trained more than 133,000 workers, supervisors, and managers "on topics such as occupational health and safety, work-related injury prevention, management obligations, and workers rights." Apple says it "collaborated with Veritéan internationally recognized leader dedicated to ensuring safe, fair, and legal conditions in the workplaceto design and deliver a five-day workshop to train human resources staff from all of our final assembly manufacturers." Basic training covers Apple's own Code and the EICC Code of Conduct, outlining workers' and manager's rights and responsibilities. To continually improve its training program, company is working with "the Fair Labor Association (FLA), a nonprofit organization dedicated to improving working conditions in factories worldwide." Beginning in 2008, Apple also began a pilot initiative called the Supplier Employee Education and Development (SEED) program, which set up classrooms of 500 iMacs to help train manufacturing workers. That program includes "progressive English-language courses, associate degree programs linked to three universities, and a selection of computer and technical skills courses." Apple reports that last year, "a total of 14,800 workers participated in these programs, including 7,120 who took English-language courses and 7,561 who completed technical skills courses. An additional 119 students continue to work toward their associate degrees and expect to graduate in 2010." Third, Apple claims a "leadership stance in the ethical recruitment and management of foreign contract workers." The report notes that "as a result of our audits and corrective actions, foreign workers have been reimbursed $2.2 million in recruitment fee overcharges." The reimbursed fees relate to a complex problem related to the hiring of foreign contract workers. Apple says its audits revealed that "some of our suppliers work with third-party labor agencies to source workers from other countries. These agencies, in turn, may work through multiple subagencies: in the hiring country, the workers home country, and, in some cases, all the way back in the workers home village." These layers of agencies each extract worker-paid fees. "By the time the worker has paid all fees across these agencies, the total cost may equal many months wages and exceed legal limitsand many workers need to incur significant debt to pay these fees. Apples Code has always strictly prohibited all forms of involuntary labor." Apple says it "met with government officials from Taiwan, Thailand, and the Philippines to understand their laws and programs around recruitment and management of foreign workers. These programs include direct hire processes that greatly reduce the fees charged to foreign workers by providing government assistance in place of labor agencies." The report notes that "in 2009, Apple joined two apparel companies and another technology company as founding members of the International Labor Migration focus group facilitated by Business for Social Responsibility (BSR). Group members met in Malaysia with NGOs, trade unions, other civil society organizations, and selected shared suppliersand subsequently kicked off a pilot to improve processes for managing foreign contract workers at two Malaysian factories. "As a result, the focus group is developing supplier training tools and management resources, which Apple plans to adapt and utilize across our supply base. Under development, for example, is a new hire curriculum to provide foreign contract workers with a cultural orientation and to educate them on relevant laws, hiring and rehiring processes, and their rights in the factory environment." Fourth, the company reports that it has "continued to increase the number of facilities audited for compliance with Apples Code, completing onsite audits of 102 facilities in 2009, for a total of 190 individual facilities audited since 2007." The report details that "in 2009, Apple conducted audits at 102 facilities, including annual audits of all final assembly manufacturers, first-time audits of component and nonproduction suppliers, and 15 repeat audits of facilities where a core violation had been discovered. "During most of our audits, suppliers stated that Apple was the only company that had ever audited their facility for supplier responsibility." The report also highlighted that, "in general, annual audits of final assembly manufacturers show continued performance improvements and better working conditions. One of these facilities had a number of new violations relating to our new standards, and we are working with the suppliers management to implement corrective actions." Apple says that "In 2009, our audits identified 17 core violations: eight violations involving excessive recruitment fees; three cases where underage workers had been hired; three cases where our supplier contracted with noncertified vendors for hazardous waste disposal; and three cases of falsified records provided during the audit." Of the core issues, 98% of suppliers were in compliance. The report details issues that were discovered in audits, and what measures were taken to address those problems. In addition to issues related to workers, Apple also reports that it "requires our suppliers of tantalum capacitors to certify they use only materials that have been produced through a socially and environmentally responsible process. In 2009, we extended our certification requirement to tungsten used in iPhone vibration motors." The supply chain for these materials "consists of many types of businessesincluding mines, brokers, ore processors and refiners, component manufacturers, and board assembly manufacturersbefore reaching final assembly manufacturers. The combination of a lengthy supply chain and a refining process makes it difficult to track and trace tantalum from the mine to finished productsa challenge that Apple and others are tackling in a variety of ways. "Apple is an active participant in the Extractives Workgroup, a joint effort of the EICC and the Global e-Sustainability Initiative (GeSI), focused on the extraction of minerals used by the electronics industry and their movement through its supply chains. The group has commissioned the nonprofit organization RESOLVE to map the supply chain for tantalum and tin, and to develop standards that apply throughout the supply chain."